Visitors can't help but notice a quilted message to welcome them to your home. Banner Size: 10" x 32". 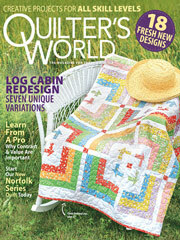 Explore our free quilt patterns and satisfy your soul's creativity. Just like people, no two quilts are exactly alike, and that makes quilting even more satisfying. You've made a masterpiece never seen before, something completely new. This collection of free, downloadable quilt patterns is suitable for any project you desire. Baby quilts are often among the most popular. Plus, find a beginner quilt pattern with simple lines that you could make for a baby, an older child, or really anyone you want. Quilting is a surefire way to show others you care. Maybe you create a baby quilt for each new grandchild, a festive quilted masterpiece for your holiday gift exchanges, or even bed quilts that you donate to shelters and other charitable organizations. Whatever your purpose in quilting, you'll find patterns to fulfill your needs. If you're a novice quilter, you'll also find many easy quilt patterns to try, and get helpful information in our Quilt Glossary that might answer your questions.